A tender, moist Cinnamon Zucchini Streusel Coffee Cake loaded with good for you zucchini and spicy cinnamon chips. 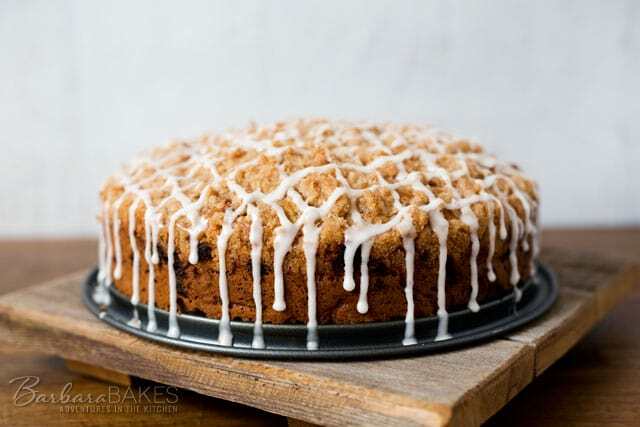 It’s crowned with a sweet, crumbly streusel topping and finished with a pretty glaze. If you’ve ever grown zucchini, you know one plant produces more zucchini than one family can eat. When my neighbor shared her bounty with me, I thought about making my Cinnamon Zucchini Muffins but decided instead to change things up and turn the recipe into a coffee cake. My family and I are crazy about coffee cakes, especially if they have a streusel topping. But I couldn’t stop with a streusel topping, because my husband thinks every coffee cake also needs a sweet glaze. To make pretty drips down the edges of the coffee cake, put the glaze in a Ziploc bag and cut a whole in one corner of the bag. Then make a little puddle of the glaze on the edge of the coffee cake and let gravity work it’s magic. Hershey’s makes cinnamon baking chips. They can be a little bit difficult to find, but stores seem to carry them more in the fall and winter. I’ve had good luck finding them at Walmart, and if you live in Utah, Harmons usually carries them year round. You can also order them from Amazon or King Arthur Flour. My family inhaled this coffee cake. I had planned on taking a slice to my zucchini giving neighbor, but that didn’t happen. She has however, put in her request for a loaf of Chocolate Chocolate Chip Zucchini Bread. That’s on my to-do list for this week. 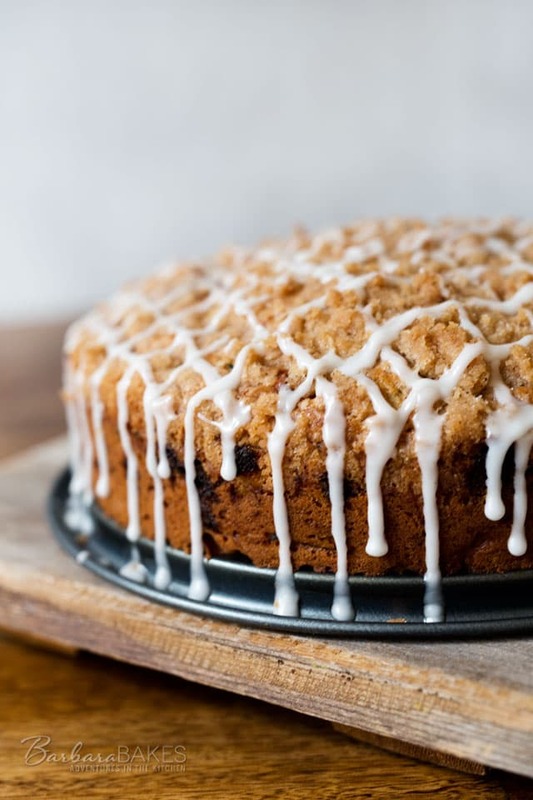 Add this Cinnamon Zucchini Streusel Coffee Cake to your to-do list this week. Your family will be glad you did. Preheat oven to 350°. Spray a 9-inch springform pan with non-stick cooking spray with flour. Prepare Crumb Topping: In a small bowl, combine sugar, flour, and cinnamon. Add butter and mix until mixture is crumbly. Set aside. In a mixing bowl, whisk together flour, baking powder, soda, salt, cinnamon, and pumpkin pie spice; set aside. In a large bowl combine sour cream, sugar, melted butter, eggs, and vanilla; beat at medium speed of an electric mixer until well blended. Add flour mixture and mix just until blended. Mix in zucchini and cinnamon chips. Spread batter evenly into prepared pan. Sprinkle with crumb topping. Bake for 40 minutes or until a toothpick inserted into the center comes out clean. Icing: Whisk together powdered sugar and milk to create a thin glaze. Can you make this without a springform pan? 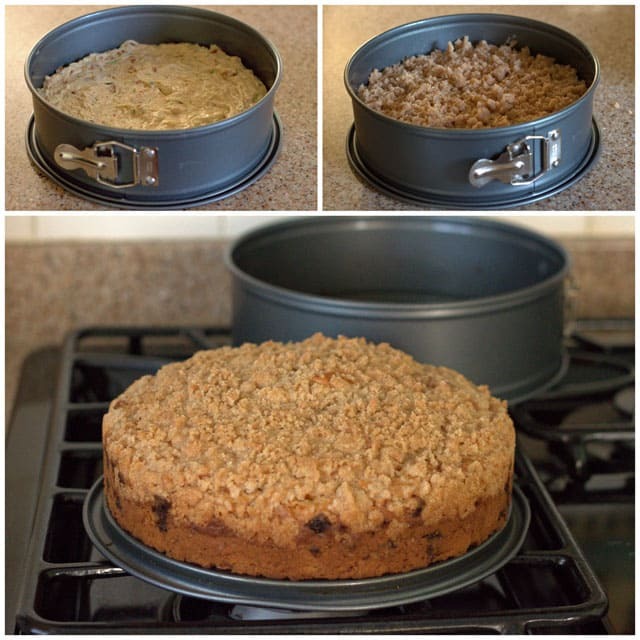 Hi Tonee – yes, you can use a regular cake pan. It’s just easier to serve when you use the springform pan. 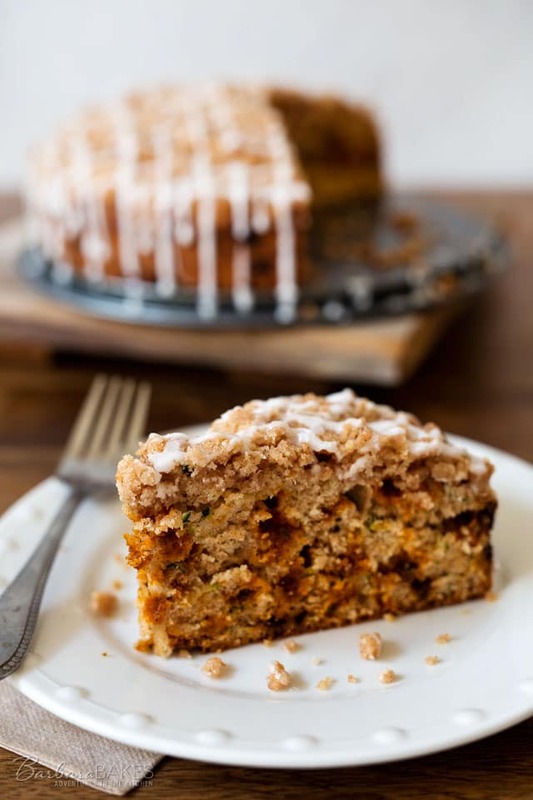 Zucchini in a coffee cake! Sounds very interesting. Have to try this some time. I love how the icing is looking on the cake! I love coffee cakes too! I’m so glad you made this zucchini coffee cake. Now I have another coffee cake to try! Love it! Thanks Nagi – I hope you’ll give it a try!